Friday’s session continued to witness a typical consolidation as the benchmark index NIFTY50 oscillated in a capped range and ended the day with a nominal loss of 1.25 points or 0.01%. The Markets continued to show resilience as it recovered significantly from the low point of the day before ending flat. As we enter into expiry, we see that this is not yet the time when we throw caution to the wind. The Markets on the Daily Chart still continue to remain little overstretched. Though we may see buoyancy continuing to persist, we will still need to protect the profits with each up move that we witness. Monday’s opening is likely to be quiet. 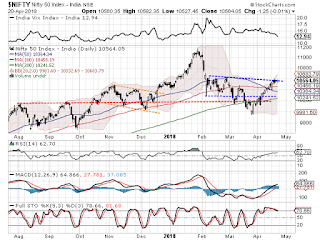 The levels of 10580 and 10625 will act as immediate resistance for the Markets. Supports come in at 10530 and 10480 zones. The Relative Strength Index – RSI on the Daily Chart is 62.6975 and it remains neutral showing no divergence against the price. The Daily MACD stays bullish while trading above its signal line. A spinning top that occurred on the candles signaled indecisiveness on part of market participants. Pattern analysis shows Markets continuing to resist at a pattern resistance area. This is the upper range of the broad rectangle formation that the NIFTY has formed. Though Markets are expected to move past these levels, it may not happen without some consolidation happening in the Markets. Overall, despite buoyant undercurrent that is more than evident, there are certain factors which we cannot ignore. The NIFTY PCR (Put to Call Ratio) still continues to remain at elevated levels. Also, the sharp decline in volatility (VIX) also signals calmness in the Markets. This calmness may become complacency and may itself become cause of return of some volatility. We will also see expiry happening this week as well. If we take a cumulative view of all of these factors, though it may not be a time to start shorting the Markets but it is certainly a time where we continue to protect our profits vigilantly at higher levels. A cautiously positive view is advised for the day. Resilient technical set up is observed in stocks like CGPOWER, HINDZINC, GODREJ PROPERTIES, HINDALCO, ASHOK LEYLAND, CYIENT, BEL, TECH MAHINDRA, BATA INDIA and UPL.